Innovative ideas for teaching movement to your marching band. Join experienced teacher, judge, and clinician Jeff Young as he and his staff guide you through a system of teaching visual fundamentals that has earned acclaim and success at both the state and national levels. 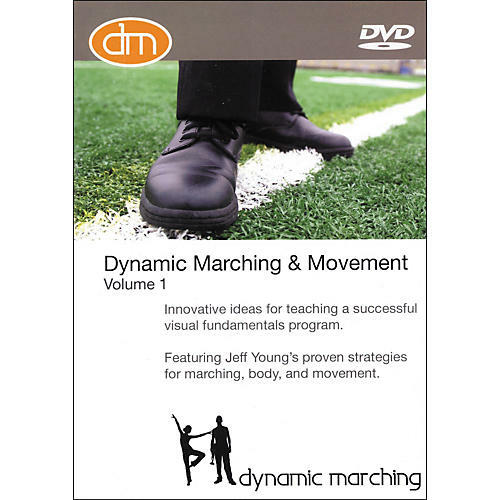 The Dynamic Marching and Movement DVD from Hal Leonard is an excellent teaching tool that will provide you with a clear and proven method for teaching the basics of posture, body movement, and marching band formations. This system is built upon innovative warm-up, stretch, and dance basics that teach the musician proper techniques in all aspects of moving in unison as part of a marching band. Chapters include: Posture, Instrument Carriage, Body and Dance Basics, Marching Fundamentals, and Strength and Fitness. The sooner you order, the sooner you get Jeff Young's proven strategies for improving marching, body, and movement.